The business and the brand are suffering. That cold truth, more than any trade gone wrong, draft-day mistake or free agent frenzy overpay, should be enough to spark change near the top of the Oilers’ organization. It’s gotten to the point with general manager Peter Chiarelli where everyone outside the organization is openly wondering what they’re waiting for. 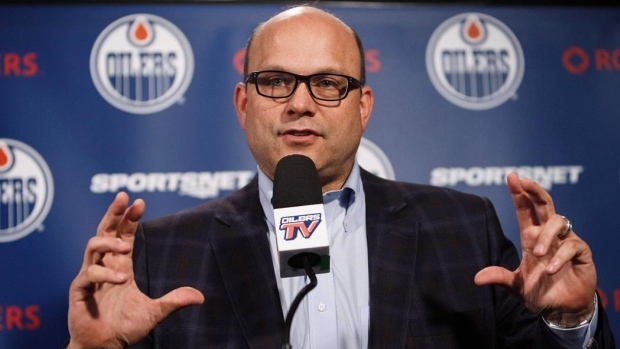 Bob Nicholson, Daryl Katz and company must surely be asking themselves if Chiarelli can be trusted with his hands on the wheel for another trade deadline. They must know the fan base absolutely doesn’t think he should be. With season ticket and suite leases up for renewal, the promise of a brighter future can’t possibly be made with a straight face as things currently sit. Lower bowl tickets are regularly available at well below face value. Season ticket holders’ complaints about not being able to offload tickets have become a familiar refrain. “I’m not renewing,” is a frustrated rallying cry on Facebook pages everywhere. Yet as the Oilers sat Sunday night, thoroughly defeated in their stalls following one of the most embarrassing performances of the season, the group was just three points out of a playoff spot. By the grace of the hockey gods, the Oilers’ recent failures have been matched by the likes of Minnesota, Anaheim and St. Louis, three other underachievers in the mix for the final wild-card berth. But you wouldn’t know it from the fans, who seem disconnected with the possibility of a playoff berth and far more focused on what has gone wrong instead of what may go right. The list of deals gone wrong from previous years is lengthy, many of them hurting this lineup nightly. The mistakes continue to pile up this season. Taking on water, with a playoff spot in jeopardy, Chiarelli blew more holes into the bottom of the boat with trades that hurt more than they helped. Ryan Strome for Ryan Spooner and Drake Caggiula for Brandon Manning were knee-jerk deals that seemed at odds with what his room wants and his team needs. Like every manager, Chiarelli has had his wins as well, but they are too few, and too far between to put much of a dent in the case one can make against him. Losing your top defenceman is supposed to hurt, but when it buckles your entire team for a month, you aren’t built properly. It seems inevitable that a change is coming. This team isn’t where the fan base feels it should be. It isn’t where the hockey world feels it should be, and it can’t be where the owner felt it should be. The Oilers have the best player in the world as their foundation but rather than build support around him, they’ve piled more on to his shoulders. That’s not a winning formula – on the ice or in the heart and minds of the paying public.